The genus Pareiorhaphis comprises around a dozen relatively small-growing suckermouth catfish species which are mostly restricted to coastal river drainages between the states of Bahia and Rio Grande do Sul in eastern Brazil. A new member of the genus from the rios Piraquê-Açu and Reis Magos, two small coastal rivers in Espírito Santo state is described in the latest issue of the journal ‘Neotropical Ichthyology’. Pareiorhaphis ruschii differs from all congeners except P. azygolechis in possessing a densely fringed margin to the lower lip (vs. smooth or slightly fringed). It’s also told apart from all other Pareiorhaphis species except P. garbei and P. azygolechis in having a series of 6-10 (usually 7-9) small, median, preadipose, azygous plates which form a low postdorsal ridge between the dorsal and adipose fins (vs. 0-5 preadipose plates). P. ruschii is further distinguished from all remaining species except P. calmoni, P. bahianus, P. nudulus, P. hypselurus, and P. stomias by having the pectoral-fin spine very long and straight, reaching the distal third of the pelvic fin when adpressed in adult males (vs. spine short and curved and maximally, and extending to approximately half of the pelvic-fin length). It’s also differentiated from all congeners except P. eurycephalus, P. hypselurus, P. stomias, and P. stephanus by possessing an asymmetrical the hypural plate with the lower lobe longer than the upper (vs. hypural plate approximately symmetrical). The new species is sexually dimorphic with mature males possessing a skin fold on the dorsal surface of the unbranched pelvic-fin ray, a thickened pectoral-fin spine, and fleshy lobes on the lateral margins of the head with hypertrophied odontodes emerging from these lobes and also on the pectoral-fin rays. These features are shared with other Pareiorhaphis species. For further information please refer to the full, open access paper: Pereira, E. H. L., P. Lehmann A., and R. E. Reis. 2012. 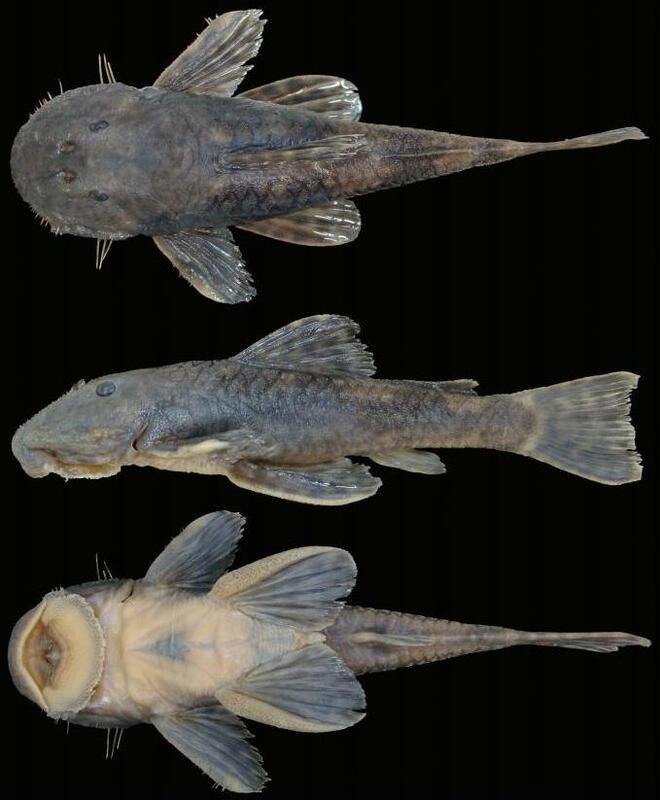 A new species of the Neoplecostomine catfish Pareiorhaphis (Siluriformes: Loricariidae) from the Coastal basins of Espírito Santo, Eastern Brazil. Neotropical Ichthyology 10(3): 539-546.